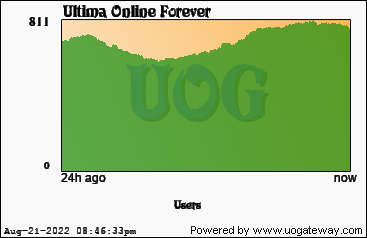 Ultima Online Forever(UO:R) is made of balance and nostalgia. Hosted on a high speed dedicated server backed by active and committed staff. Constantly updated, weekly events, balanced economy, minimal grinding, faction pvp, many custom mobs and dungeons. Join us today and start your adventure! Stats last updated 218 seconds(s) ago using 259116 data samples.